Nose: Sweet aromas, with vibrant oak spice and notes of dried cocoa. Palate: Intense ground coffee fuses with orange peel and smoked wood hints. A lengthy finish of candied fruits, and malted almonds which matures slowly. 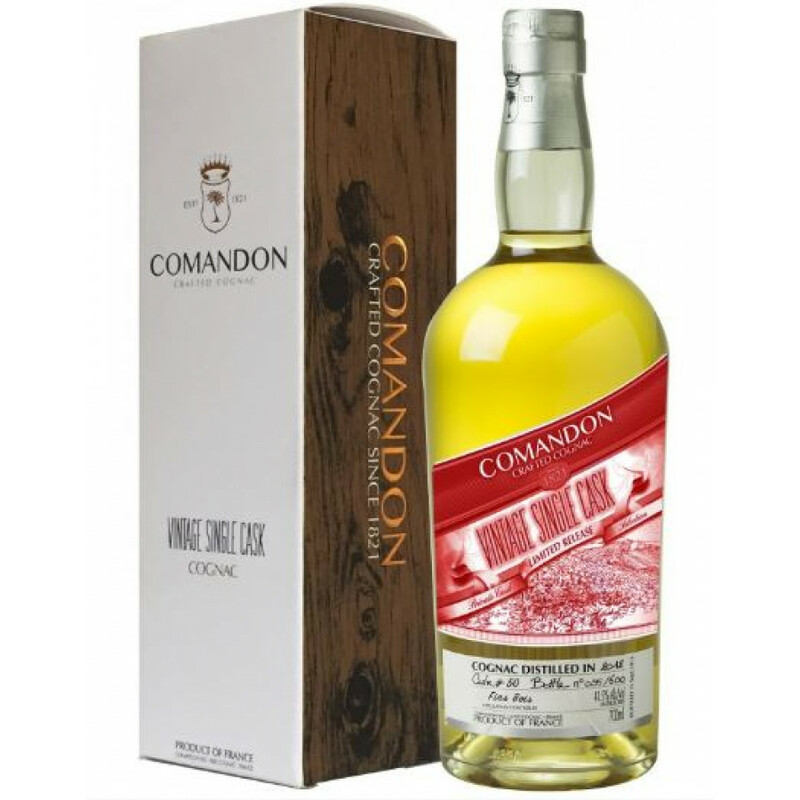 Delivering a fine single barrel Cognac to defy the norm, we present the Comandon Vintage Single Cask 2012 Fins Bois. In selecting one barrel from one particular year, or showcasing one terroir, they have defined what it means to produce Vintage Cognacs. The Fins Bois is the largest of the Cognac crus, is known for its round and supple eaux-de-vie that ages a lot quicker than those from the other terroirs. This 2012 Vintage Fins Bois Cognac has a toasted and herby profile, and as a relatively young Cognac, defies all stereotypes that Cognac needs to be old to make an incredible impact on your senses. The idea of a ‘single cask’ is often associated with whiskey and bourbon, but Comandon proves that Cognac can certainly deliver, too. The concept of single casks Cognacs is a well-practiced art form at Comandon. They are famous for defying the norm and choosing to select one barrel from one year or one particular cru. In this case, they have selected a Vintage Cognac from the Fins Bois. It has been aged in oak barrels that have been previously used to age Cognac and then lightly toasted to bring out the oaky aroma. There is a 400 bottle yield of this cask, so move quickly before it’s all gone. A classic bottle, with a wonderful scarlet graphic illustration of the Comandon estate in the heart of the Cognac region. It also comes in a stylish presentation sleeve. Enjoy it neat. This Cognac house does not believe in striving to achieve the same eaux-de-vie time and time again; instead, they craft one-of-a-kind Cognacs. Patrick and Franck Vigneron scrupulously review every barrel and hand-select less than 1% of their Cognacs for bottling.